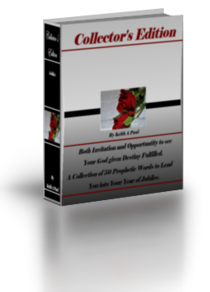 The chapters of this E Book will engage you with the reality of His Presence. Pastors and Leaders can use this as a personal resource and / or for ministry use in newsletters, reports and weekly publications. We do require that our ministry be properly referenced with all content that is used. This book releases both invitation and opportunity to see your God given destiny accelerated as He impacts you with the reality of His Kingdom. We pray that His radical supernatural Presence would overtake you until you become saturated with Him. This book brings together into one place a year's worth of prophetic words. It is 50 Chapters in length and is symbolic of your 50th Jubilee Year. Jesus called this the year of the favor of the Lord. Now is His acceptable time. Expect increase and God to bring you into His promises. May your debts and burdens be removed as the Holy Spirit ministers to you through this book.